This kitchen or bar storage rack is made from stainless steel and offers enough room to fit up to six wine bottles and six wine glasses. Constructed from durable stainless steel with an attractive chrome finish, this glass and bottle rack is specially designed to be conveniently mounted under a cabinet or shelf. Included hardware makes it easy to install. Just be sure to measure the thickness of your cabinet or shelving before mounting to avoid piercing through its top side. 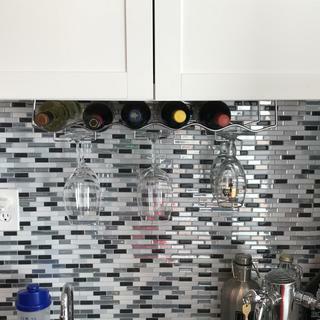 Once the rack is up, you'll have space to efficiently store up to six wine or liquor bottles and six stemmed cocktail or wine glasses, including martini glasses, coupes, and flutes. Add to the organization and efficiency of your kitchen or bar with the Under Cabinet 6 Wine Bottle & 6 Glass Rack. Seems sturdy cane with all the hardware. Nice looking rack. Wish it had room for three glasses a row but it works well. This rack is of good construction, only the posts were a little bit bend and the screw package had some unusable screws. Can this be got in black? BEST ANSWER: This is currently only available in stainless steel.